The Lower Cape Fear River Blueprint is a collaborative planning effort, led by the North Carolina Coastal Federation, to protect, manage and restore the important estuarine and riverine natural resources of the lower Cape Fear River. With support from The Orton Foundation, the Blueprint will empower communities and partners to work together to improve the river and surrounding watershed’s overall health and water quality. 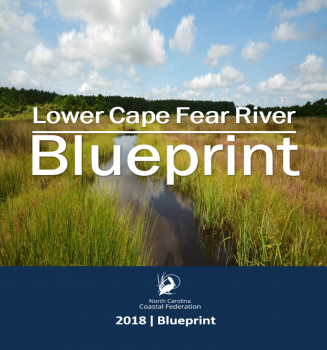 The Lower Cape Fear River Blueprint expands upon existing efforts by the Cape Fear River Partnership and Cape Fear Arch by creating a holistic platform of support and advocacy for the river and its resources. By restoring natural features like wetlands, resilient shorelines, urban tree canopies, natural forests and healthy upstream watersheds, the surrounding coastal communities can accrue quality of life benefits today, enhance fish and wildlife resources and help prepare for foreseeable resiliency challenges. Goal 1: Protect and restore water quality. Goal 2: Have resilient living shorelines that protect water quality and natural estuarine function and provide thriving habitat for fish and wildlife. Goal 3: Have oyster habitats thrive and support vibrant fisheries, good water quality and resilient estuarine shorelines. Goal 4: Protect and preserve native coastal wetland populations that are free of invasive species Phragmites australis. The Lower Cape Fear River provides critical coastal and riverine habitat, storm and flood protection and commercial and recreational fishery resources. It is also a popular recreational destination, an economic driver for the southeastern region of North Carolina and embodies a rich historic and cultural heritage. The river also serves as an important source of drinking water for many coastal communities, including the City of Wilmington. The Blueprint will serve as a long-term guide to protecting the long-term health of the river by ensuring there is a clear plan in place for compatible and sustainable development. The plan will also address current pollution and habitat loss, which is negatively affecting oysters, fisheries and overall water quality. 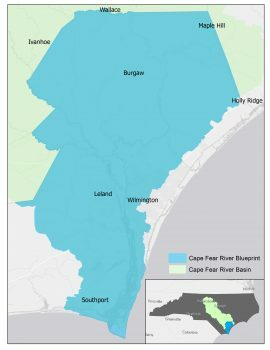 Protection of the Lower Cape Fear River is critical to the well-being of all who live, work and play in the southeastern part of the North Carolina coast. Follow the Cape Fear Story Map to journey down the Lower Cape Fear River. See images, maps and stories that highlight the unique and wonderful Cape Fear River Estuary.